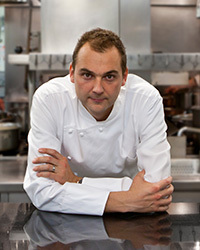 Education: Began culinary training in Switzerland at age 14. Two people: My mom and my mentor, Gérard Rabaey. From my mom I learned about cooking seasonally and locally; from Gérard I learned about the importance of organization and precision, and about the beauty that lies in repetition. A perfect grilled ham and cheese sandwich. The perfect ham and cheese sandwich is all about focusing on quality ingredients and about simple techniques. You start with great bread, a well-cured ham and a sharp local cheese, and the rest is easy. A little butter in a pan and a little patience—in the end you’ll have a sandwich that is at once comforting and delicious. Is there a culinary skill or type of dish you wish you were better at? I would like to know more about how to cook Japanese food. I love it, but don’t know much about it. What is the best-bang-for-the buck ingredient? Carrots! I like to treat them like meat, roasting them in duck fat or grinding them into tartare. Name three restaurants you are dying to go to in the next year. Fäviken: They’re doing some amazing things with very local food in a very remote location. El Celler de Can Roca: It’s a family-run restaurant that has been around for a long time, but one that never tires of trying to do something new. Husk: Sean Brock is bringing a lot of attention to the South, to Southern ingredients and recipes. When I was in Brazil last year, I had the opportunity to meet Pelé—he gave me a signed soccer shirt that is one of my most prized possessions. Our whole roast duck with honey and lavender, and our whole roast chicken with foie gras and brioche. How to boil water. And how to make spaghetti. If you were going to take Thomas Keller out to eat, where would it be? I would go with Thomas Keller to L’Ambroisie. He has been such a great source of inspiration and a wonderful friend. I would love to share the experience of dining at such an extraordinary Parisian restaurant with him, talking about our lives and the future of food and restaurants. If you were facing an emergency and could take only one backpack of supplies, what would you bring? Oysters, a shucking knife and lemons. I could subsist on the oysters with a squeeze of lemon juice and wouldn’t need any fire or electricity to cook them. Heirloom grains. As people move further away from a meat-based diet, I think the focus will shift to using grains as the central focus of our food supply. What’s the best house cocktail? Manhattans are the best house cocktails. There are so many variations on it so there’s something for everyone. And they’re easy to make! Whole roast duck, and milk and honey. I have fond memories from growing up in Switzerland and drinking a glass of warm milk with a spoonful of honey before bed. One day, feeling nostalgic for home, I reimagined this simple bedtime treat as a dessert at EMP. I was amazed by how many people found that simple dessert to be so comforting and so reminiscent of their own childhoods. We now do a version of it at the NoMad and both of our cookbooks have different recipes for it. It’s a flavor combination that has always been a part of me and will continue to be forever. The roast duck with lavender and honey has also been a part of me for a very long time. Provence is one of my favorite places in the world—it’s the place where I grew up going on vacation with my family, where I proposed to my wife, where I take my kids when we have the opportunity to go away. In trying to capture the essence of Provence in a dish, I came up with this. It is so simple and so delicious—the crispy, sweet and savory skin; the juicy meat, the fragrance of lavender—it’s something I could eat every day. Why Because, as he says, "I take flavor combinations that have been around for centuries and do something a little different." This can mean transforming spring basics like peas, mint and morels into a terrific vibrantly hued soup. Experience Le Pont de Brent in Brent, Switzerland; Gasthaus zum Gupf in Rehetobel, Switzerland. Least favorite childhood chore Washing greens. "I hated it. My mom would make me wash a salad six times until it was clean, even more if it had rained and the greens were dirty." Most memorable experience Cooking with Gérard Rabaey, the chef at Le Pont de Brent. "Everything was so organized. When vegetables came in, you separated them into five different sizes. It was insane." Culinary obsession Slow cooking. "We're doing low-temperature cooking, like slow-roasting fish at 160° to keep the flavor pure. We don't sear as much as we used to; the searing flavor has gotten too strong for me." Newest collaborator Food scientist and regular customer Harold McGee. "I have a dish called Fantasy of Eggs. I wanted the yolks to cook but look raw. Harold tried it using a 130° water bath and it worked. Now, when I have a question, I call him."